The Tidal Observatory was established to determine the mean sea level that is the starting point for levelling in the UK. 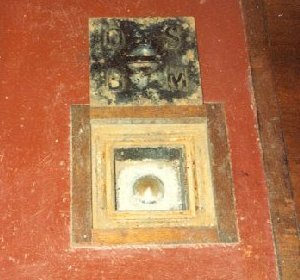 This brass bolt is the benchmark for the whole of the United Kingdom, that is, all heights are referenced to this point. The height of the benchmark was established over a six year period from 1915 to 1921, when visual observations of water level on a tide staff were made every 15 minutes, 24 hours a day, 365 days a year. From the data collected over this period, mean sea level was found and this vertical level transferred to the head of the bolt. This map shows the extent of the levelling which took place in the UK during the first half of the 20th century. Starting at Newlyn and working its way to every corner of England, Wales and Scotland, this process was all done manually using land levelling equipment. From this primary network, secondary benchmarks are set up and these are in turn used to level in the tide gauge pressure points, thereby referencing all tidal monitoring points to the same datum, and each other. This Munro gauge is shown with its cover removed during servicing. Below the gauge is the stilling well which is set into the stone pier with the inlet to the well on the open seaward side of the pier. 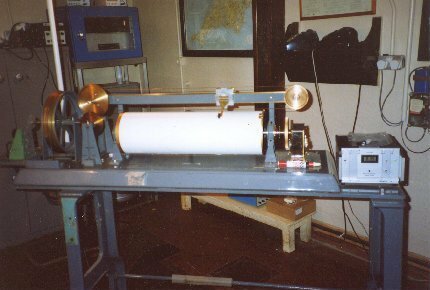 The Dataring datalogger can be seen in the background on a metal stand next to the chart. 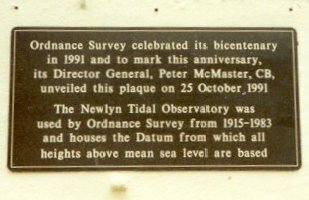 This plaque, mounted on the outside wall of the Tidal Observatory, celebrates the bicentenary of the Ordnance Survey in 1991.